My bestselling Prepping for Tomorrow series is available in Audiobook format. 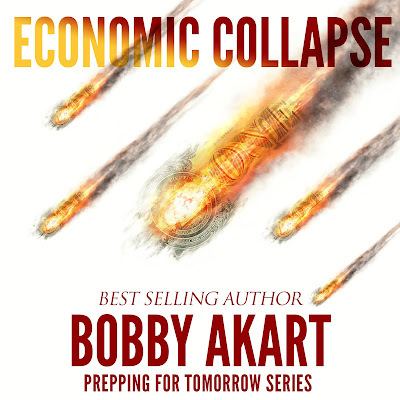 CYBER WARFARE, EMP and now, ECONOMIC COLLAPSE, an Amazon #1 Bestseller in ten genres, are all available for download at Amazon.com, Audible.com, and iTunes. You can own all of these titles for FREE by creating an Audible trial on Amazon (see the below links for details). In addition to the PREPPING FOR TOMORROW series, my critically acclaimed BOSTON BRAHMIN series is also available for download. In fact, you can choose from over 200,000 titles. If you already own the Kindle version of my books, you can receive the audio version via a special program called Whispersync for Voice. Now you can switch between reading and listening to your Kindle books in the Kindle App. Just pop in your headphones, tap the button, and keep the story going … in the car, in the gym, in the kitchen, or wherever your day takes you. To receive more information about future audiobook releases in the Prepping for Tomorrow series, or my bestselling Boston Brahmin series, please sign up for my email mailing list via the sign-up box to the right of this post.